So I did it! 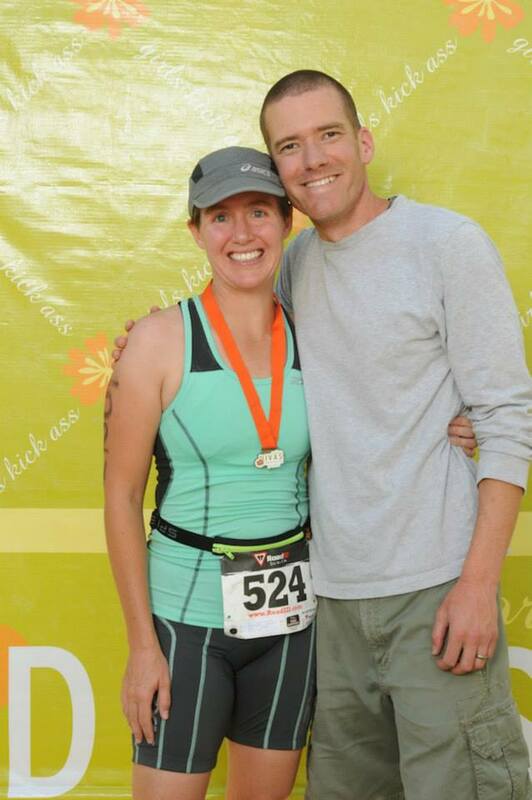 I completed my first triathalon this past weekend, and as they warned up in the clinics that I went to, I’m hooked. I have already started looking at triathlons for next summer and planning out what I will do differently and better next time. Granted when I was out in the middle of the lake freaking out I wasn’t so sure I’d make it to the end let alone think of signing up again. I’d been warned that people get nervous in the water and I went to the swim clinic and practiced in the open water and did really well. I figured I would be fine. Nothing like eating a little Humble Pie while in the middle of a lake. I started out ok, and then got super nervous about the first buoy. I rolled on my back and slowed my breathing down and was able to roll back over and start swimming again. After rounding the second buoy and making a 90 degree turn I could feel myself start getting nervous and I kept telling myself “just swim, you’ve trained for this, you can do it”. Yeah well that didn’t work, so I rolled back over and starting back stroking again and slowing my breathing. Somehow (probably because on my back I couldn’t see where I was going) I ended up way off course. Like in the middle of the lake off course. So much so that when I turned back around to look, I couldn’t see anyone or any buoy that I was suppose to swim too. I turned around a few times and finally could see a buoy way off in the distance. I started swimming towards that and after finding swimmers and figuring out which way I was to be going I joined back in. Luckily that was the buoy that pointed me back towards the end. After surviving the swim I headed towards the transition zone and then out on the bike. I’m not a bike rider in any sort of the word, having just learned how to ride a bike a few years ago. But I strapped on my helmet and took off. I was passed by some people, but I also passed people, which was fun. I road in with a big smile on my face and started off on my run. Running after riding a bike feels like your legs have turned to jello. It took almost a mile in before my legs felt like my legs again. And that was about the spot that the hill started. I knew that there was an aide station at the top of the hill, so that kept me going. It was fun being out on the running course, there were all sorts of women and we were all cheering each other on and encouraging each other as we went. The aide station was manned by the Colorado Calendar Fire Fighters and most of them didn’t have their shirts on. I didn’t really care at that point, I wanted some gaterade, and I took my cup from someone who clearly was not a fire fighter, but I was grateful to nonetheless. Coming in to the finish I was tired, I knew I was close but I couldn’t convince my legs to keep moving. Along side of me ran another lady and she said “we keep passing each other, lets finish this together”. I thought it sounded like a great idea, so I started asking her questions as we ran along. We were both moms, she had two girls, I have my two boys. She started to struggle as we were rounding the corner to head to the finish and I started encouraging her. She told me to run ahead, and I told her, “we said we were going to do this together, you can do it”. And so we did, we finished together and gave each other big hugs, even though we’d just met a few minutes before. I don’t think I would have finished as strong without her encouragement and I know she wouldn’t have without mine. It was a great race, despite my floundering in the water. I am looking forward to doing it again and a couple others as well. It was so encouraging to see women from every walk of life and fitness level out competing as well. The youngest was 11, the oldest was 71. The fasted took a little over an hour, the slowest took just a few seconds under 3 hours. I heard that the shirtless firefighters were jogging the last ½ of the run with the last person (its not always bad being last). I did my best for my first time, I can officially call myself a Tri Mommy, or in Leighton’s words, a Super Hero.